Earlier in the month, Forbes published 4 Popular Misconceptions about Microsoft – a much better job than my Microsoft Jolts The World in January. It was a solid piece about how the public is being misinformed on: Windows 8 saving the desktop, Microsoft losing the enterprise, Microsoft making lousy products, and Ballmer winning in mobile. The article hit the front page of Digg and several other sites and then was quickly buried into oblivion. I’m sure the press didn’t like the point of the article, that most Microsoft bashing uses no facts and the authors have little or no understanding of technology or business. Then on Friday, August 23, 2013, this press release hits with Microsoft CEO Steve Ballmer to retire within 12 months. Wall Street went nuts and Microsoft stock rose quickly. The press went into high gear. Steve Ballmer Just Made 625 Million by Firing Himself (Quartz) – How many of you knew Ballmer was a billionaire before he just made another billion in one day? Yes, the number grew later that day. Microsoft CEO Steve Ballmer to Retire (Redmond Magazine) – Even a namesake adds a little FUD (Fear, Uncertainty, and Doubt). To say VMware has laid siege is past history and a war that’s over with Microsoft the victor. Matrixforce hasn’t seen a new installation of VMware in over 3 years. It’s all been Microsoft Hyperv for virtualization. The Linux-based software is too complicated, no longer has any advantage in features or performance, and is generally double the cost. According to IDC, Hyperv took over the lead from VMware in Q2 of 2012. Microsoft Says CEO Ballmer to Retire Within Next Twelve Months (Bloomberg) – It’s odd that no one talks about the history of Microsoft dividends and earnings versus Apple, Google, Facebook, etc. Poisonous Employee Ranking System That Helps Explain Microsoft Decline (Slate) – The reality is that the stack rank system pre-dated Ballmer. However, it’s obvious this model should be overhauled as employer and employee motivations are not in sync. 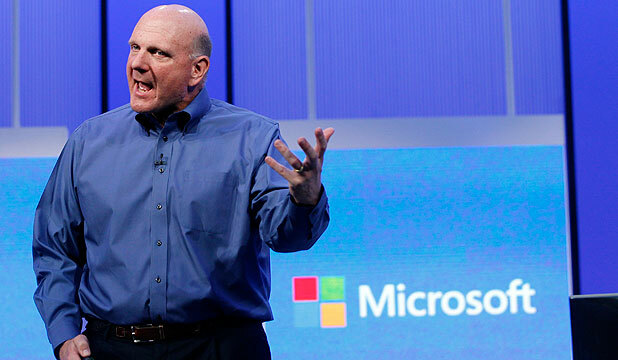 Why Steve Ballmer Failed (New Yorker) – So there must not have been any new Broadway shows or fad Italian suits to review. Besides the low blow with the YouTube video, this was just opinion and rehash of other articles. Billions in cash matters little? We’re all getting tired of Wikipedia being first and the search spam on Google. Especially as a journalist, another source is often needed and certain searches like images and social media are much more relevant on Bing. With Apple not on the board with social media and Google struggling with Google Plus, it will be interesting to see what happens to Microsoft Yammer (the Twitter of business). Ballmer Forced Out After 900 Million Surface RT Debacle Nobody even wanted a tablet before Apple iPad made it popular, despite the unfortunate name. iPad costs more, does less, and has been exposed with limited features versus Surface RT much less Pro. Microsoft was complacent on iPhone because they were dominating Blackberry. 900 Million seems like a big number, until you consider Verizon Seen Owing Apple Up to 14 Billion and in the same article Sprint has a 15 billion iPhone commitment unfulfilled. Ballmer had more Microsoft stock than any venture firm leading the push, but why didn’t Wall Street react and punish Apple with over $29 Billion worth of iPhones not sold sitting on the shelves? Steve Ballmer Names Windows Vista As Biggest Regret While CEO (Computerworld) – Vista was too different at the time to be accepted. However, three years later with few changes, Windows 7 was a big success. Not to pick on the New Yorker with Windows 1.0, but they inadvertently make a valid point: Microsoft has a long history of offering new computer interfaces to the world that required modern hardware. When is the last time Apple changed it’s interface on Mac or iPhone. Yet, you better rush to buy the new annual iPhone model in September. Why? Well, because it’s an iPhone, there’s not really anything that’s new, and the support for the largely unchanged iOS only lasts a year. Needed At Microsoft: A Catch-up Artist (NY Times) – For sure, CEO at Microsoft is a big job. However, Microsoft is winning the cloud handily with Office 365 over Google Apps. Office 365 now has a $1.5 billion annual run rate. Feds Expand Inquiry Into Microsoft (Computerworld) – Someone had to add some intrigue. However, Microsoft partners and resellers are not Microsoft. This seems like a blatant attempt to draft on current events just to mention Pakistan and Russia. Windows 8.1 Gets Released to Manufacturers (CNET) – In case you missed it amidst all of the other noise, Windows 8 is on EVERY type of device and form factor – not just PCs. If you yearn to go back to 2007, Microsoft listened and added boot directly to a desktop with a start button back. It’s interesting to read the comments in these articles. The haters are on fire in stark contrast to the demanded tolerance and political correctness of the time, while the public, press, and Wall Street give players like Apple and Google a free pass. You always hear liberals talk about how they are grounded in facts, but what’s with this irrational religion of hate toward Ballmer and Microsoft? Ballmer was responsible for raising Microsoft net income from roughly $9 billion in 2000 to over $20 billion by 2010. Enjoy your successful tenure Steve and well deserved retirement. Even in the article Why All the Hate for Steve Ballmer (Slashdot), cowardly anonymous commenters continued their crazy rants. Let’s play a game. Make a table with columns for Products, Microsoft, Apple, Google, and Facebook. Start slow with products by listing Search and Social media, marking an X in the column for the corresponding company. Then there’s an easy one hundred products for Microsoft, that the other players simply don’t have. After you throw out shiny bobbles, advertising, and time-wasting, Microsoft continues to provide tremendously more value for the world.